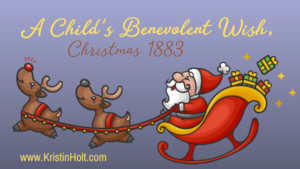 Gift-giving was a significant part of our Victorian American ancestors’ Christmas celebrations. Then, as now, Santa Claus played his role in Christmas gift-giving. 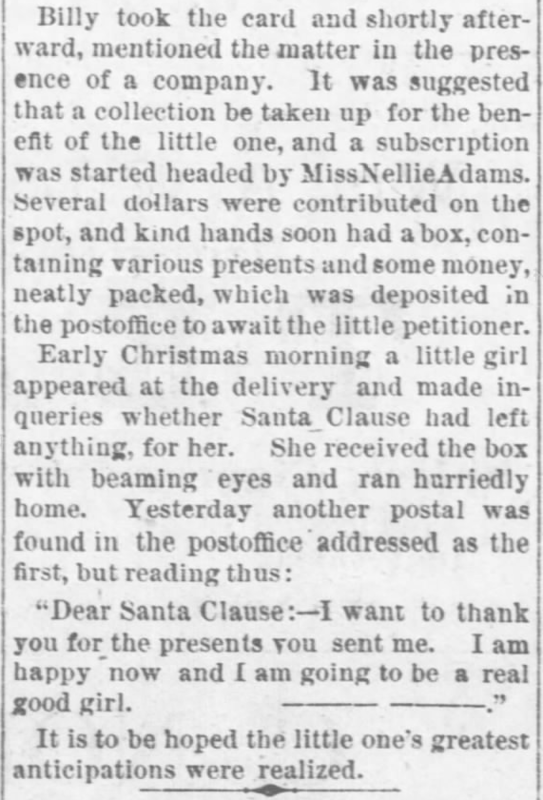 Children wrote and sent letters to Santa, either through the postal service or through “Santa’s Mailbox“–the chimney. 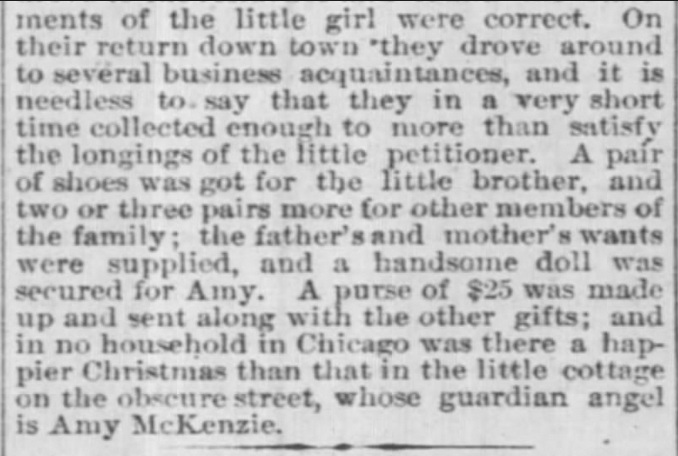 The Pantagraph of Bloomington, Illinois, on December 23, 1879. Chicago Daily Tribune of Chicago, Illinois, on December 23, 1876. The Charlotte Observer of Charlotte, North Carolina, on December 23, 1879. 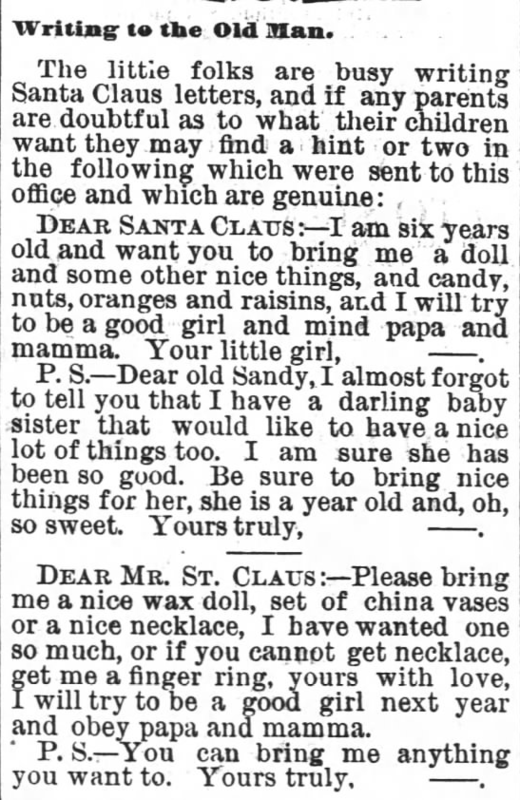 Lawrence Daily Journal of Lawrence, Kansas, on December 22, 1880. 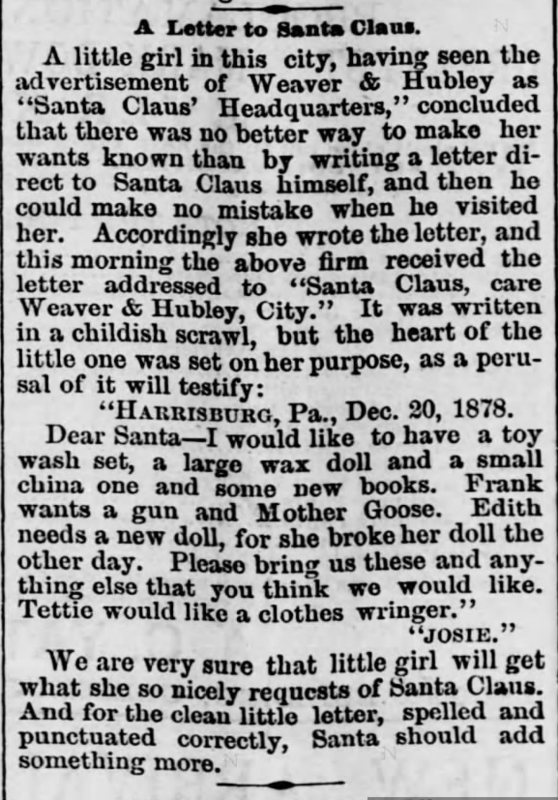 Harrisburg Telegraph of Harrisburg, Pennsylvania, on December 21, 1878. Children today would never ask for “fine paper and envelopes”, but they’d likely ask for a cell phone. What was once letter-writing to friends and acquaintances in the same town has become texting. Or an Instagram post. My, how times have changed. –Cartersville Express: Howard, the little son of Hon. W.H. 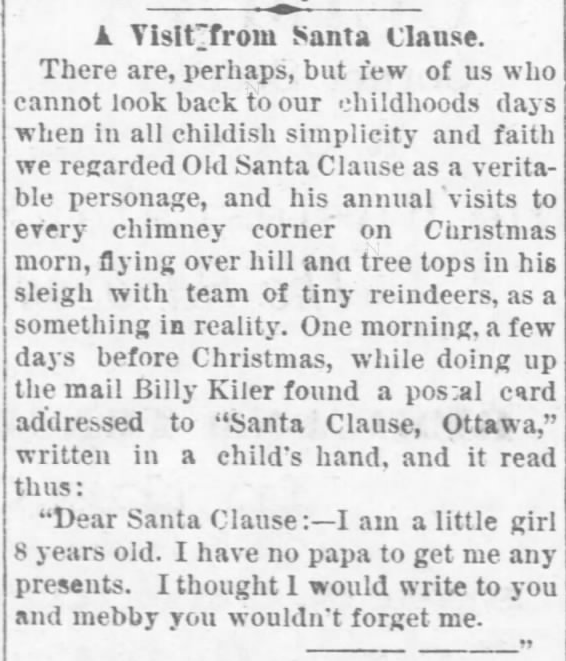 Felton, addressed the following unique letter to the giver of all good things to the little children: Dear Mr. Santa Clause: I’m bothering you again, as Christmas is here. Well to begin with, I want some fine paper and envelopes, and a finger ring and something else nice. Please leave a little note as to how you are getting on–also your family. Good bye, Santa Clause. I wish you well until next year. Please put a little something in my stocking. Our house is low and you can easily get on it with your reindeer. Our house is three miles from the village of Cartersville. I have been in Washington, but am at home now. I hope you can find me. Good bye, dear Santa Clause. 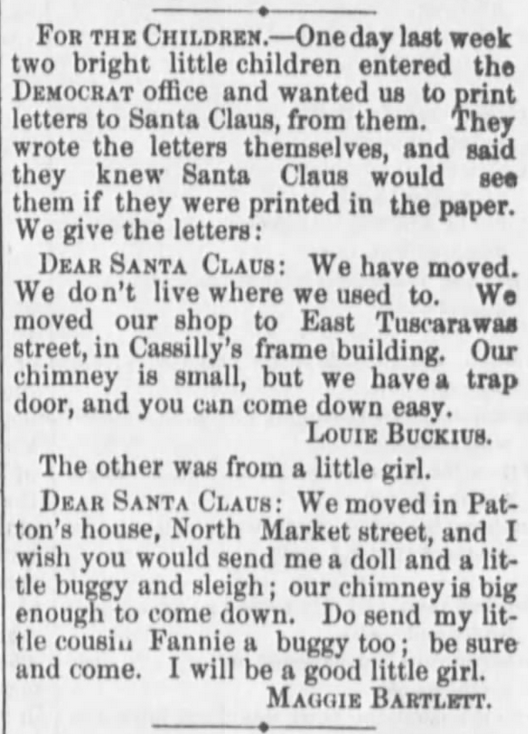 The Stark County Democrat of Canton, Ohio, on December 24, 1874. Detroit Free Press of Detroit, Michigan, on December 24, 1878. Can you imagine being the parent of a little one who dropped a letter in the mail, and it ended up posted in the local paper? Some newspaper notices referred to a child posting a letter as they’d no doubt seen their parents do. What if you were Mr. or Mrs. Martin? 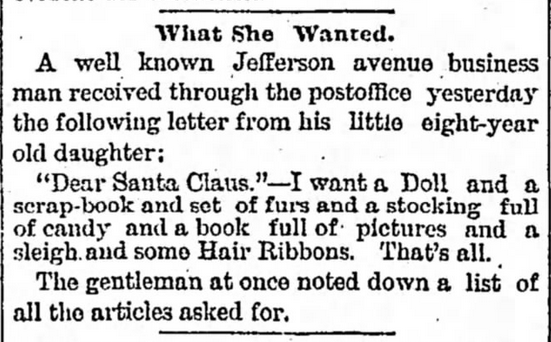 The Atchison Daily Champion of Atchison, Kansas, on December 21, 1883. 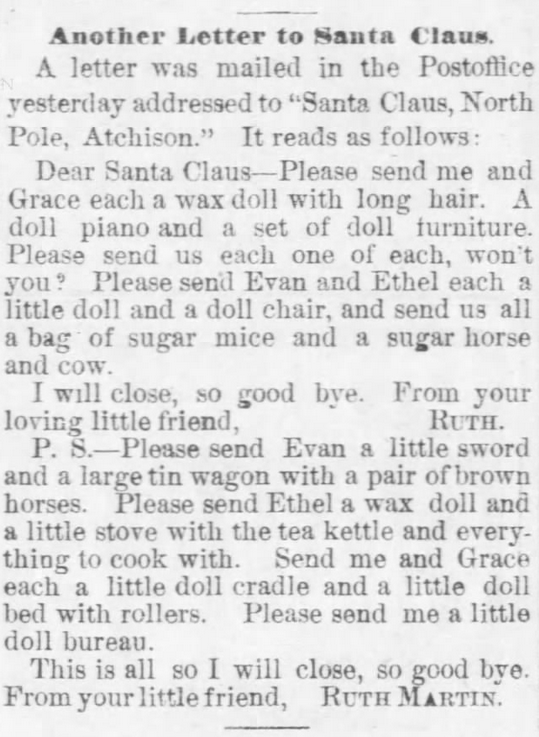 The Ottawa Daily Republic of Ottawa, Kansas, on December 28, 1880. Part 1 of 2. 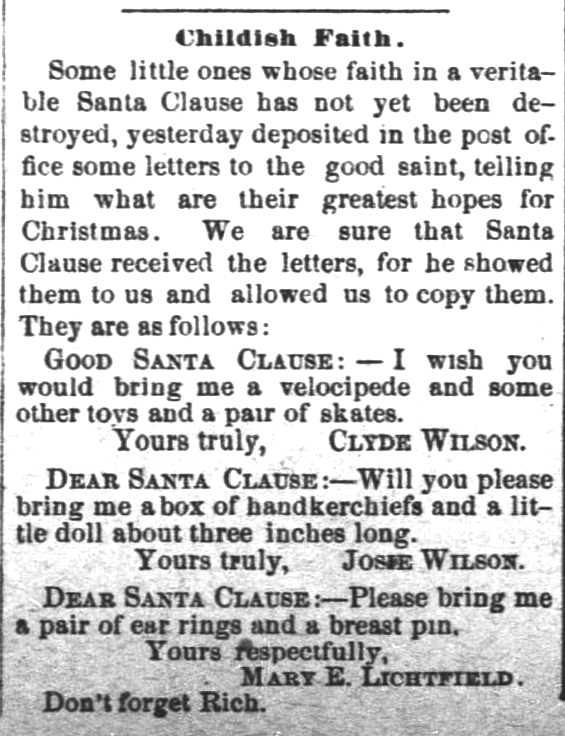 The Ottawa Daily Republic of Ottawa, Kansas, on December 28, 1880. Part 2 of 2. The Cincinnati Enquirer of Cincinnati, Ohio, on December 28, 1876. Part 1 of 2. The Cincinnati Enquirer of Cincinnati, Ohio, on December 28, 1876. Part 2 of 2. Note the request for an address. 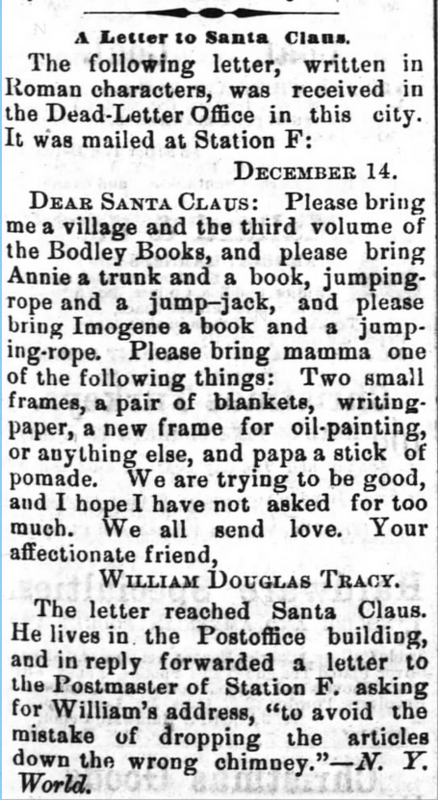 It seems someone wanted to be Santa’s Helper and see that William Douglas Tracy received ‘a reply’ to his letter. 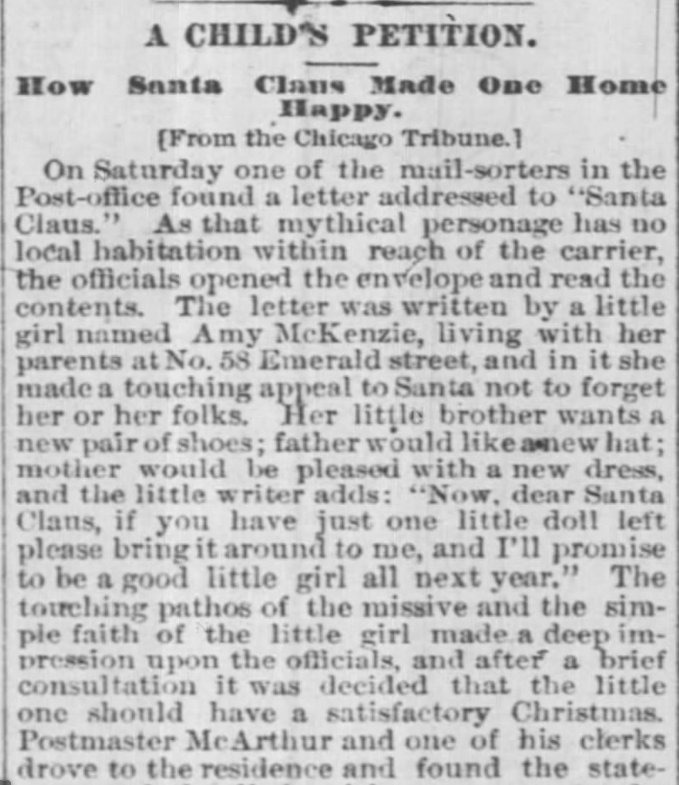 The Wilmington Morning Star of Wilmington, North Carolina, on December 24, 1878. SANTA’S SLEIGH… Santa is my neighbor! Hunter Kendall, my hero in Home for Christmas, is a man in comfortable circumstances. He has plenty and to spare, so in this Christmas-rich novella, he involves the girl next door (he’s been in love with her since they were children) to help him with his “Secret Santa” efforts. How else can he convince her to allow him to keep company with her? His older brother left Miranda at the altar, and she’s not willing to give any man a chance…especially Hunter. Who could resist a man like Hunter, who is keenly aware of the needs of those around him? He’s a man who secretly goes about ensuring the poor in and around Mountain Home (his town) don’t go without basic necessities. He doesn’t want recognition, fame, or gratitude…all he wants is Miranda Finlay. If you’ve not yet read Home for Christmas, I invite you to enjoy this 99-cent novella this Christmas season. This story has been compared to a Hallmark Movie–family-centered, sweet (innocent romance), Rated G, and brimming with all things Christmas. This title is a quick read at just 120 paperback pages, and introduces my Holidays in Mountain Home series, including my newest release, The Marshal’s Surrender (a far more “winter” romantic suspense than a “Christmas story”). Right now is a perfect time to grab book #3 as it’s priced at 99-cents for just a few more days on a Release Week Special Discount, and will soon increase to $2.99. Home for Christmas has 80 reviews on Amazon, and an average of 4.6 stars (out of 5). 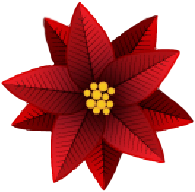 On Goodreads, Home for Christmas has an average of 4.0 stars with 106 ratings. 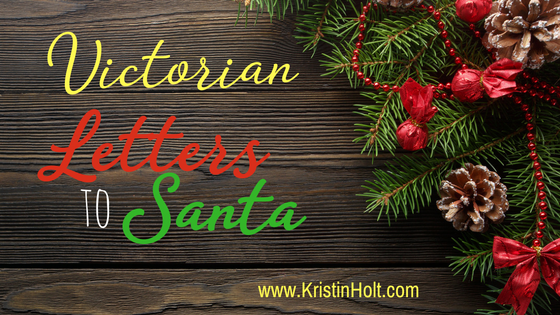 Did you write letters to Santa when you were a child? What do you remember about those letters? 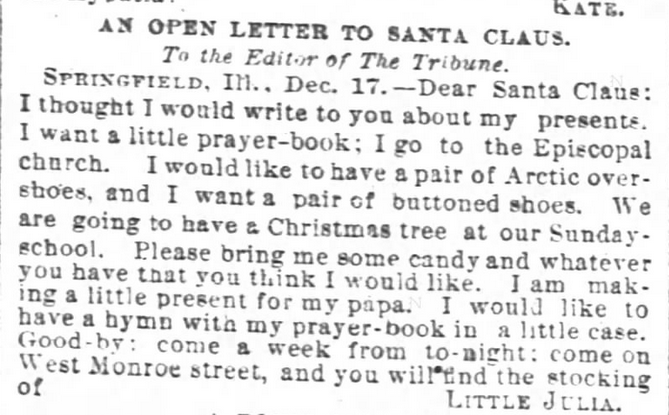 Have you helped answer a child’s letter to Santa Claus? What can you tell us about it? May Day Oddities in the Victorian United States Victorian America and Easter Eggs Victorian Americans and Mardi Gras Victorian Americans Observed Groundhog Day? Victorian America Celebrates Halloween Victorian Americans Celebrate Oktoberfest Victorian America Celebrates Labor Day Pioneer Day: Utah’s Victorian History Victorian America Celebrates Independence Day Victorian America Observes Flag Day Victorian America Observes Memorial Day Victorian America Observes Mother’s Day–on Sweet Americana Sweethearts Victorian America Celebrates Arbor Day Victorian America Celebrates Easter Victorian America & April Fool’s Day–on Sweet Americana Sweethearts Victorian America Celebrates St. Patrick’s Day Victorian Leap Year Traditions, Part 1 Victorian Leap-Year Traditions, Part 2 Leap Into Love– The Victorian Way: Sweet Americana Sweethearts Victorian Era Valentine’s Day Victorian New Year Celebrations, on Sweet Americana Sweethearts A Victorian Menu for New Year’s Day, 1892 American Victorian Era Christmas Celebrations Victorian Era Thanksgiving Celebrations Happy Birthday, United States!